“Hygge,” the Danish word for enjoying life’s simple pleasures, is most often used to describe cozy, wintertime activities. But it just as easily applies to the feeling of backyard summertime pursuits, in a space with a magical ambience, created by outdoor lighting ideas, cozy seating arrangements, and an atmosphere that’s both nostalgic and whimsical at once. Whether you’ve got your backyard in mind, or just a quick weekend camping trip, using lights to create a dreamy vibe for your outdoor space is both easy and affordable. These 20 outdoor lighting ideas will inspire you to create the ultimate in backyard summertime hygge. Originating in Polynesia, Tiki Torches are now synonymous with hot summer nights and backyard BBQs. The bamboo torch has a boho-vibe, and because they’re easy to set up and highly portable, they work for anything from lighting up your porch to remote boondocking. Just attach to a porch railing or push into the ground, and voila–easy lighting! There are a variety of types of tiki torches, including solar powered, although the most common are fueled by gas or oil. 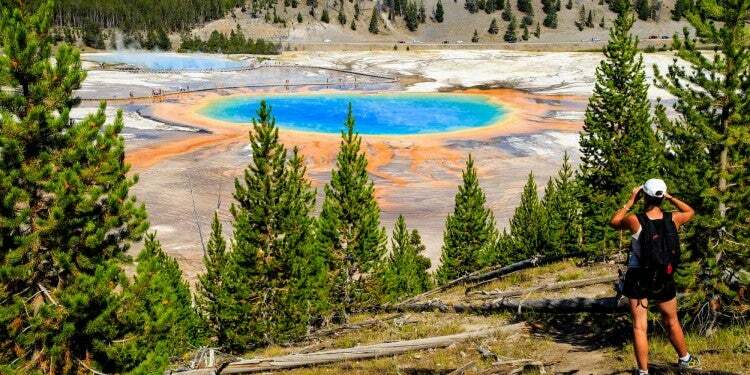 For these, there is a reservoir at the top of the torch that holds fuel. The torch is then lit. Tiki torches are an affordable lighting option, although there is the repeated cost of fuel if you opt for oil or gas. Easily found at your local hardware store, Tiki torches have a wide-range in prices. TIKI brand torches are in the mid-range price point, at about $20 dollars per torch. Edison style lights are a simple, gorgeous throwback to the first lightbulbs ever made (by their namesake, Thomas Edison). 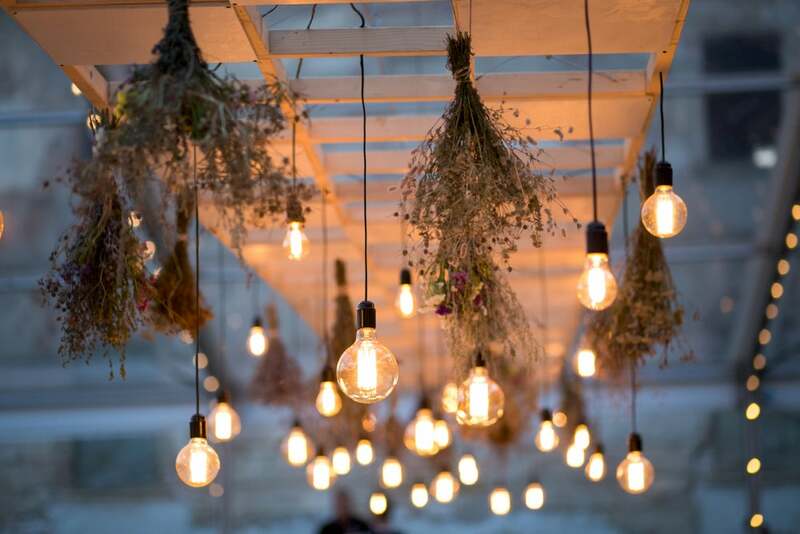 Creating an outdoor space with a string of Edison lights means creating a look that’s cozy, nostalgic, and simple. Found easily online or in a local homegoods store, they’re also a highly accessible outdoor lighting option. 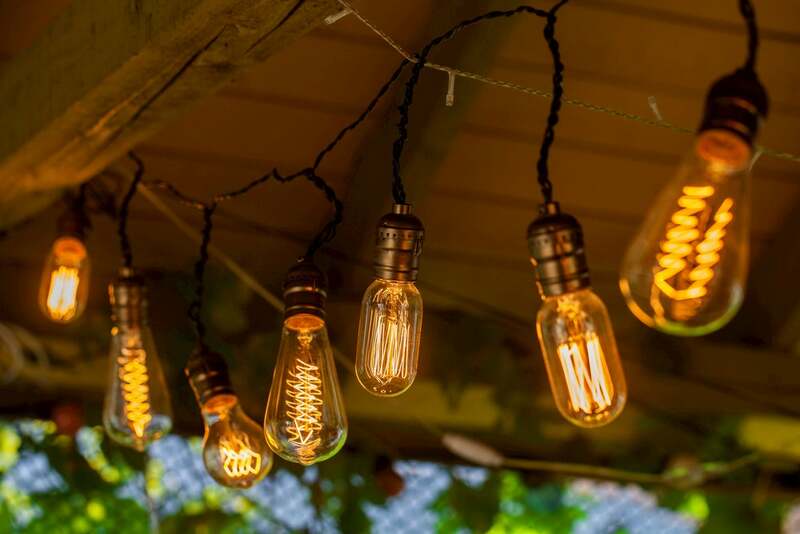 These solar-powered Edison string lights offer a great retro flair for any campsite or patio. 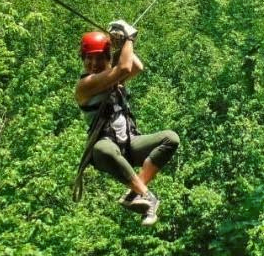 String from tree to tree to create a more defined backyard hang space, or string from your RV awning to turn your motorhome into an upscale home-away-from-home. First, cut a generous amount of twine and begin to wrap around the neck of the bottle. If you don’t have a lip on your bottle, use an appropriate glue to hold it in place. After a few loops, extend the twine up to create a larger loop for hanging your jar. Finish by wrapping around the neck again, but in the opposite direction for security. Next, settle some pebbles in the bottom of your jar, and place your candle in the center amongst them. The pebbles will help the candle to stay centered. Light your candle with a long-stemmed match or grill lighter, and hang them wherever you’d like. The more jars you place in a group, the more light you’ll have. You’ll use your large nail and hammer to create holes in your tin cans. Begin by hammering holes in each can in any desired pattern. The more holes you have, the more light you’ll have. When you have completed your pattern, place candle in the bottom of the tin. 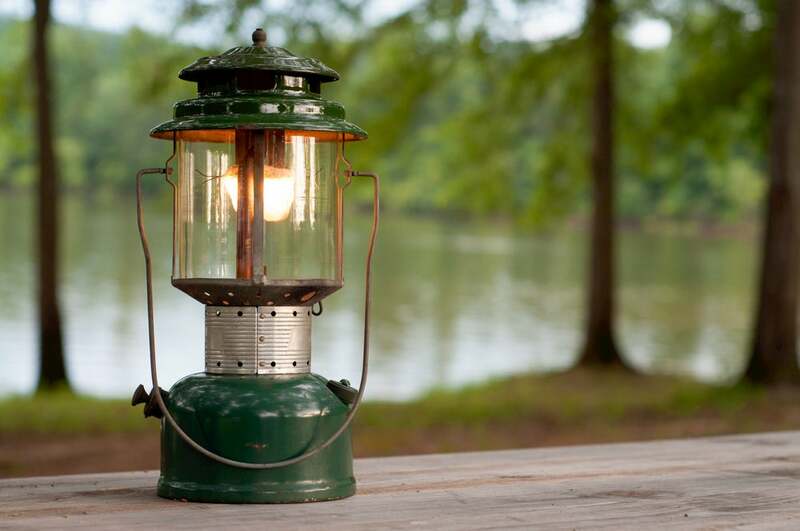 These lanterns are great for lighting up an outhouse, pathways, or to use for low light at a picnic table. 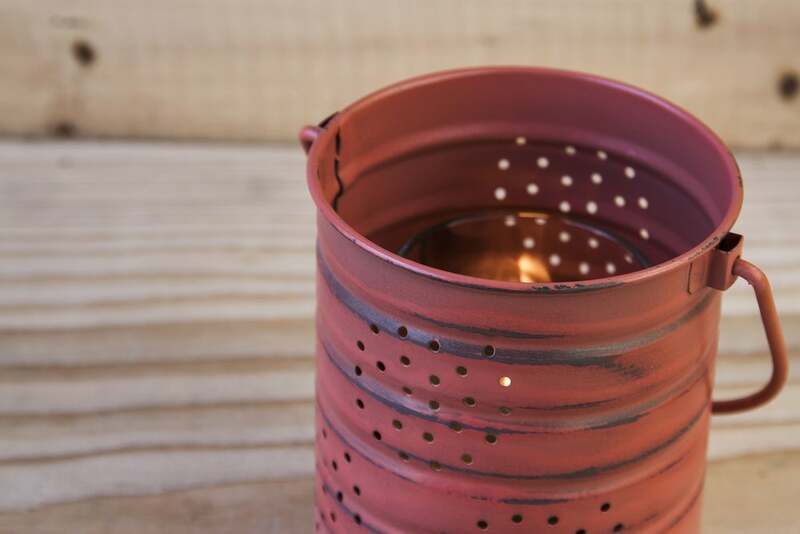 As with previous outdoor lighting ideas on this list, the tin can lantern is a budget-friendly option. 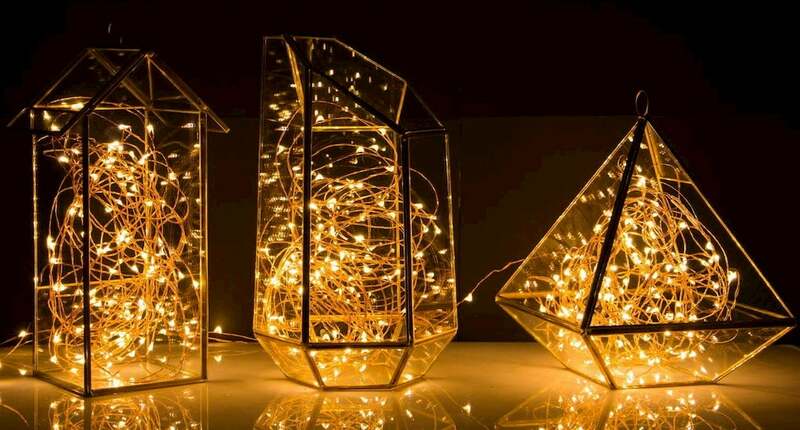 Made from waterproof copper wires and stainless steel, these white lights can be formed into any shape, such as fireworks, stars, or even spirals. And, as they’re solar-powered, they can be used anywhere from the backcountry to your backyard. A four pack costs $41.99 on Amazon. Candles might be the most simple and budget-friendly ideas for outdoor lighting, but this . To make, gather clean Mason jars in various sizes, and candles. Light candle and tip in order to drip wax onto the bottom of the jar. Extinguish flame, and then place candle down onto wax and press down to secure. The more candles you can put in the bottom of the jar, the more light you’ll have. 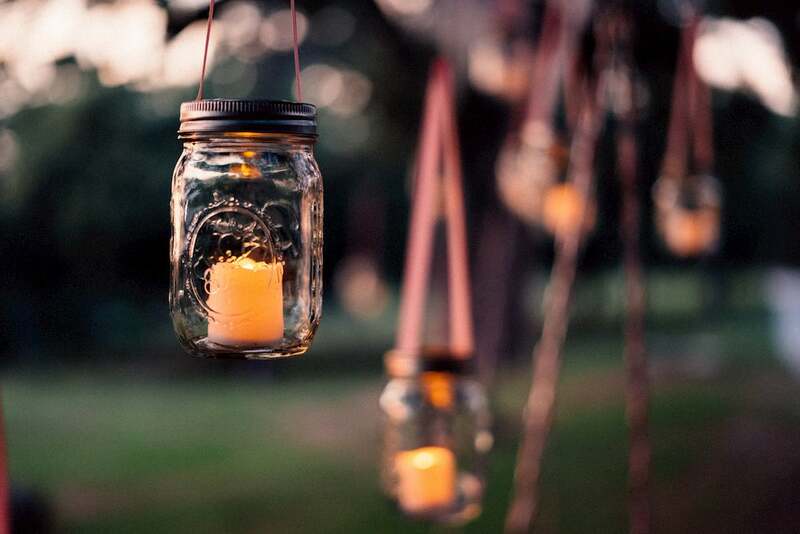 Mason jar lanterns are a beautiful, simple idea for creating a relaxed backyard ambience or cozy campsite atmosphere. You’ll start by creating a circle out of your branches. You’ll bind them together using twine; make sure to leave some gaps in your branches to weave your string lights through, as you’ll want to tuck the lights so as not to see the wire. When you’ve finished, secure the string lights with a bit more twine. Hang, using additional twine, from a tree branch, archway, or an awning. This one of the many outdoor lighting ideas that can work off-grid, as well—just use solar string lights. 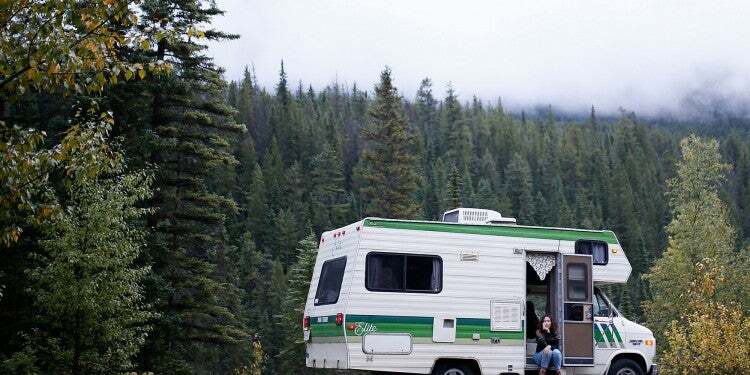 A set of white curtain lights creates the most dreamy space at your campsite or outdoor space—just picture a sheer layer of lights hanging from your RV awning, a nearby tree branch, or in your backyard as a patio lighting option. These 30 volt LED lights are budget friendly, too, at $22.99. They have 8 different light effects to choose from as well, from Slow Fade to Twinkle to Stay On. These micro-sized LED lights create the most magical outdoor space–they’re so small, but they truly shine twice their size. The delicate copper wire bends easily, disappearing into whatever object you’re using to hold them—plant, tree branch, or even a vine-covered post. They’re simple, pretty, and they last. Find them on Amazon, where a 40 foot strand will cost you about 10 dollars. You’ll need to have a power source, but with low energy consumption, this outdoor lighting idea is wonderful for your backyard–whether it’s the backyard of your campsite or your home. 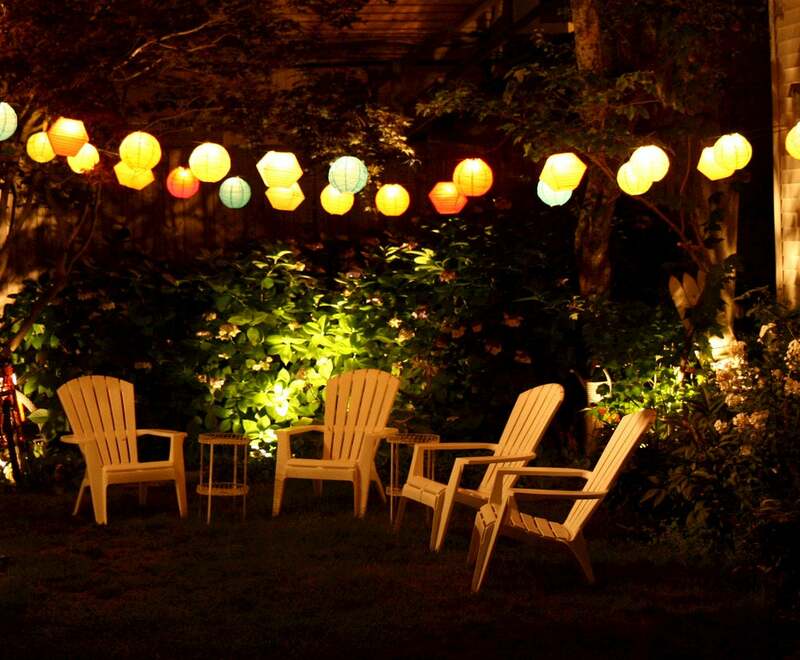 For a bohemian vibe, paper lanterns hanging in your outdoor space help to create a stunning atmosphere. There are a variety of options to choose from; for the backyard, it might be fine to have plug-in lanterns if you have an accessible power source. 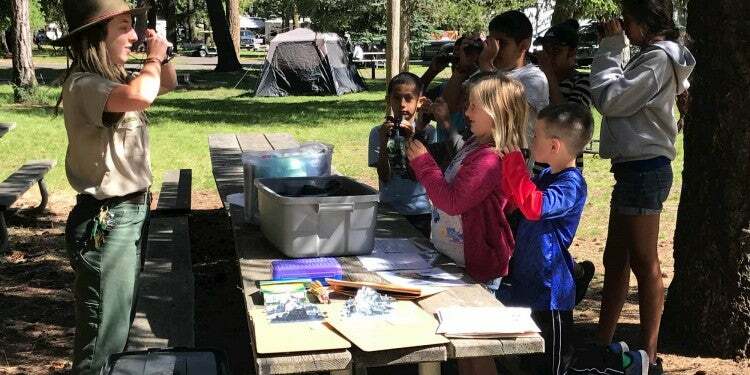 Otherwise, if you’re trying to create a certain feel for your home-away-from-home, there are solar or battery-operated lanterns that work well at campsites or in the backcountry. You can find a 10-pack of deconstructed lanterns on Amazon for close to $17, and in a massive variety of colors. Is it just us, or do LED Strips lend a sci-fi vibe to an outdoor space? LED strip lights create a fun runway to an outdoor bathroom, or really to help define any backyard spaces or campsite boundaries. In general, colored LED strips tend to provide less light; white LED strips are much brighter if you’re actually in need of functional lighting. LED strips are relatively cheap, and will shine brighter with less energy usage. Installing them in your RV is a easy and flashy RV lighting hack. This is one of few outdoor lighting ideas that’s really best for your backyard, as, due to its size and contents, you’ll want to keep this stationary. To make, you’ll need to first decide where you’ll be placing your planters and then make note of the type of lighting your plants will be receiving. If your planters will be in full sun, for example, your options will have to be full-sun loving plants—we love the idea of growing food in your planters, such as tomatoes or herbs. 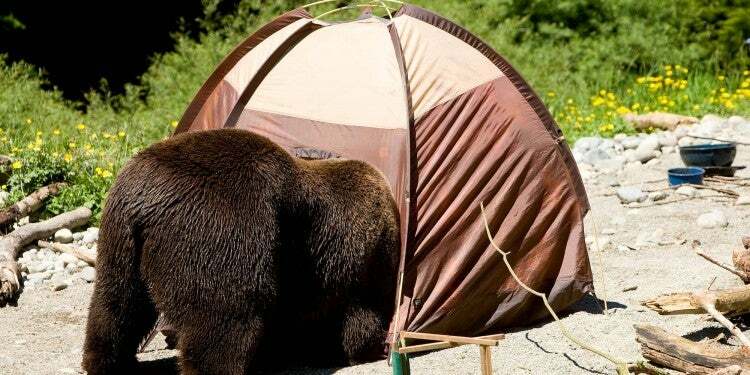 Next, gather your supplies. 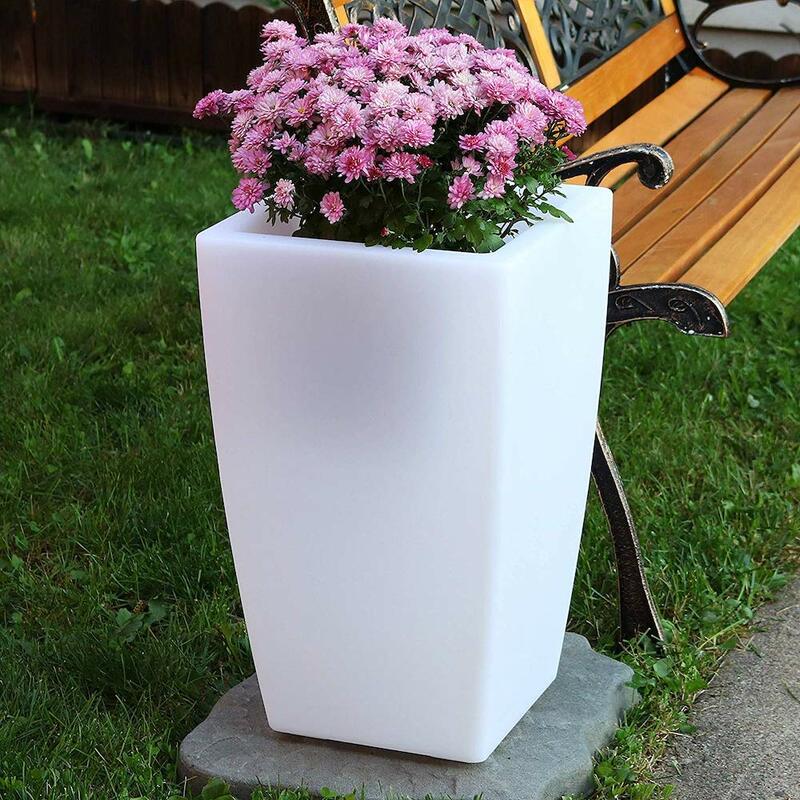 These planters come full assembled and ready to plant, so you’ll just need your choice of plants and dirt. Place your plant in the planter, allow your planter to fully charge, and there you have it: a functional outdoor lighting option that serves a purpose during the day, too. Each planter glows for 6-8 hours per charge. This is an outdoor lighting idea that perfectly blends in with a rocky landscape—these lights are made to resemble stones. They charge by sunlight during the day, and by night they shine for 6-8 hours, illuminating your deck, yard, or outdoor space. A set of four costs $28.27 on Amazon. Citronella Candles are typically used for keeping the bugs at bay, so using a number of these strongly-scented candles will not only light up your outdoor space, but you’ll combat the issue of a buggy summer night. Found at your nearest hardware or homegoods store, grab a number of these scented candles and place around your campsite or backyard space. 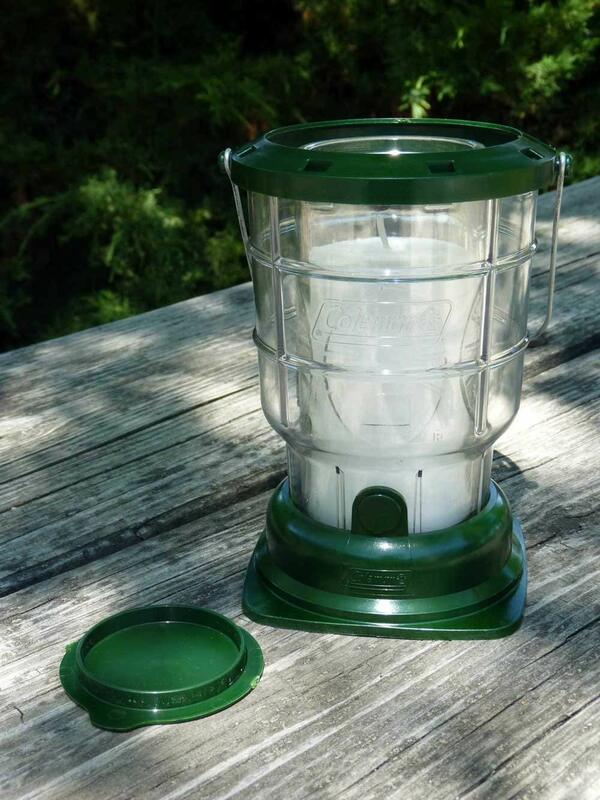 Citronella candles come in a variety of options…as just a basic candle, or even as an outdoor lantern, such as this citronella Coleman lantern for under six dollars. If you went camping as a child, you probably remember these lanterns around the picnic table (I haven’t used one since I was a child, 25 years ago, and I can still remember exactly how it sounds when you light them). There’s a reason why propane lanterns are still made and used: they’re reliable, emit a solid amount of light, and are portable. A Coleman propane lantern is steady in all types of weather, lasts up to 13 hours on one 16.4 oz canister, and has adjustable settings for desired brightness. This easy DIY project creates a tranquil, zen backyard vibe. All you need? Tea candles and a bird bath. To make, simply light and float tea candles in a bird bath. 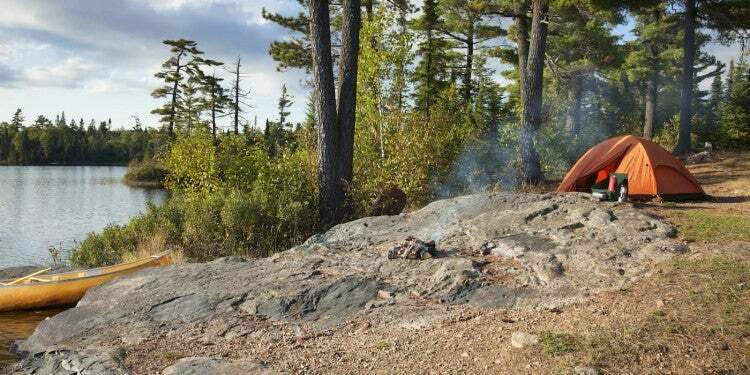 For a campsite, it’s possible to create this same ambience: pack bowls of various size to fill with water and tea candles, and place them around your campsite for simple lighting. Perfect for a campsite eating area, these outdoor lighting ideas are DIY and both romantic and simple. To make, you’ll need a large glass hurricane, candles, glue, and tissue paper. 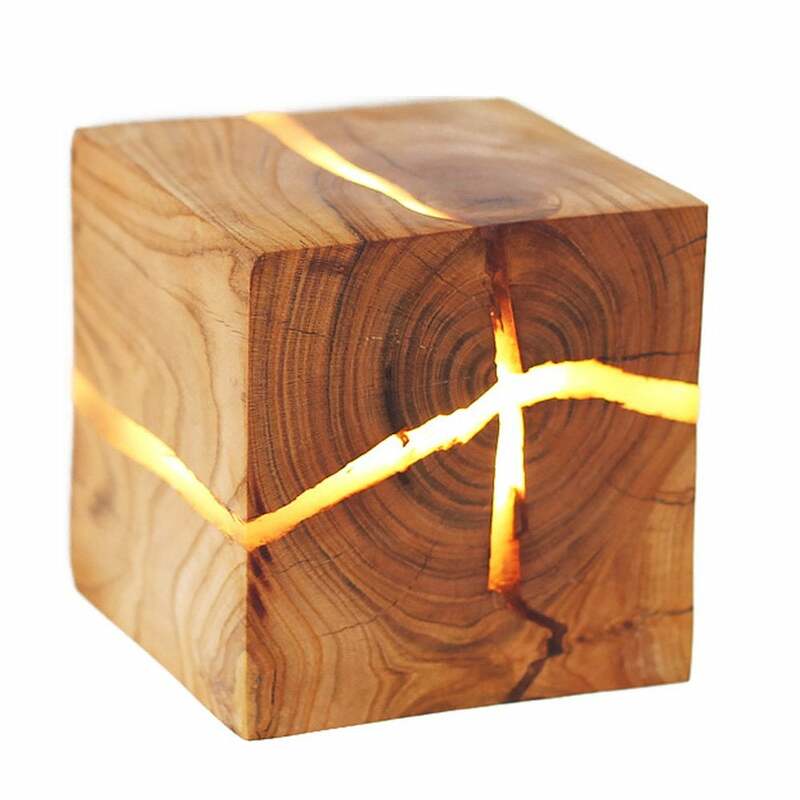 Although these are a bit pricier than other options on this list ($77 for a small-size log lamp), this is a true art piece that’s also functional for your backyard. You’ll begin by cutting your log to desired size. Next, you’ll work on chiseling out the inside of the log, but leaving the top of the log intact. Once you’ve hollowed out your log, slice long slits down the side of your log for light to escape. Next, place your light in the hollowed-out space within the log. It’s a time-consuming project that requires skill, but the result is a unique and artistic lighting option. For a delicate, bohemian atmosphere, solar powered fairy lights ensconced within glass orbs have an almost magical feeling to them; swinging from a branch, tucked into trees, they appear almost floating, or as if they’re living. The solar power allows them to be used anywhere from your backyard to the backcountry, and at just under $20, they won’t break the bank, either.